ProHealth Care - West Bend, Menomonee Falls, Mequon | Murphy Media Group, Inc.
ProHealth Care wanted consumers to become actively involved in helping the company improve its services. The campaign launched with a series of teaser billboards, direct mail, and teaser newspaper ads driving traffic to a website and asking people to answer questions like “I wish my doctor could _____” and “Healthcare would be better if _____”. 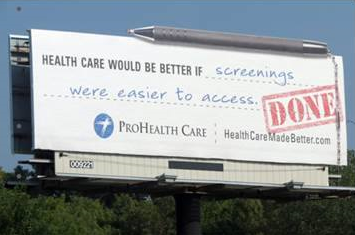 Weeks later, ProHealth Care revealed the changes they made on new billboard ads, showing what was implemented based on their consumers’ requests. During the teaser period, over a thousand people visited their site to offer their suggestions for improvements, such as receiving same-day test results and the ability to email their doctors.